The next entry in my Women’s Book March is The Only Harmless Great Thing by Brooke Bolander! I seem to be reading a lot of alternate history lately (see Everfair by Nisi Shawl, which kicked off this challenge). It could be my response to current events, a heightened desire to seek out alternatives to the way history seems to be proceeding, although it’s not out of any escapist impulse–indeed, if anything, the alternate history Bolander sketches in this powerful novella somehow paints an even darker portrait of a certain shameful period in American history. In the early days of the twentieth century, a group of female factory workers in Newark, New Jersey slowly died of radiation poisoning. Around the same time, an Indian elephant was deliberately put to death by electricity in Coney Island. These are the facts. Bolander weaves these two events together to create a poignantly angry tale of injustices great and small that asks, Are there some histories that should be indelible, never to be forgotten lest we perpetuate the same mistakes? Or is the truth of history always destined to be twisted out of shape in the retelling? This was not an easy story to read. The lyrical language is immersive and beautiful, but requires close attention to follow sometimes. And often Bolander is using that beautiful language to describe horrible things: her description of what it’s like to slowly die of oral cancer (acquired from ingesting radium) is completely horrifying. 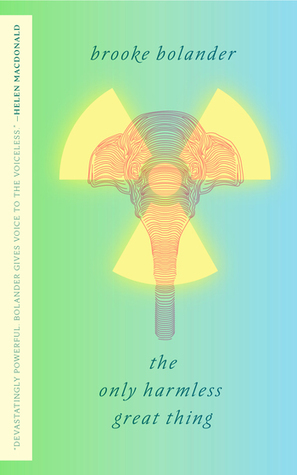 Yet at the same time I found this story difficult to put down: in less than 100 pages, Bolander creates a fully fleshed out elephant culture, with an origin story, kinship system, and social structure. Her characters are deftly drawn and so real-seeming that it makes the injustices they suffer all the more infuriating. And yet the ending suggests a kind of justice may still be possible even at the cost of one’s own life — the small but essential justice of having one’s voice heard after living in silence. This entry was posted in Articles, Book Reviews, books, Fiction, science fiction, Women's Book March Challenge and tagged alternate history, books, science fiction, social commentary, women authors. Bookmark the permalink.